I define myself as many things: A painter. A graphic designer. A mother. A wife. An artist. A traveler. An optimist. A believer. It’s not something I was always so comfortable with — that is, feeling confident calling myself so many things. At any given time, I would describe myself as one of those things, but not the others. It took a while until I could fully embrace the fact that most of what we are in our lives is completely intertwined. I am a wife, a mother, a sister, a daughter… all in the web of family. I am a designer, a journaler, a painter, a sketcher… all in the web of creativity. I am a business owner, an accountability partner, a student, a mentor… all in the web of my career. These webs are what make our lives complete. And these webs are what make me realize and appreciate how my work can impact the rest of my life, and vice versa. The majority of my design work takes place in the travel and tourism space, giving birth to and developing brands for specific destinations around the Finger Lakes, New York State, and beyond. During this work, I am able to travel to beautiful destinations, where I meet amazing people who tell equally amazing stories of where they live, work, and play. I learn about the attributes that make each destination unique. I learn about the history that has impacted the area today. I learn about the ongoing developments, and I get to share in the vision for the future. I love this time during the project — the time I define as research in my BRANCH process. It’s a time when I absorb what a place means, what it stands for, and what potential it holds for the rest of the world. Sometimes, I’ll even pull out my easel to paint in a place that I’m branding. Because I’m most present when painting, it’s this practice that helps me really center on what’s most important in a destination. And what’s important is typically a handful of things. The beauty of the Finger Lakes isn’t just in its waterways — it’s in its wine; its culinary scene; its parks; its history. The mystique of the Adirondacks isn’t just in its mountains — it’s in its lakes; its pubs; its arts community. Destinations, much like individuals, are often characterized by one thing, but the detriment is that they’re good at many. Instead of zoning in on one thing, I look at the web that’s weaved by all things. This way of looking at destinations (and individuals, really) reminds me that we shouldn’t mistake simple for ordinary. It reminds me that there is so much to every story. It reminds me that unless we’re fully present, it’s impossible to witness, explore, and capture the details, the stories, and the people that weave the web that is ultimately a destination. Destination branding brings me to places I might never go to otherwise. In Cayuga County, I went on a hike with the town of Montezuma’s historian. In Ontario County, I kayaked the beautiful Canandaigua Lake. 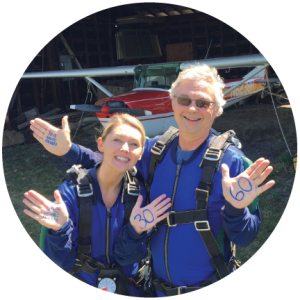 In Seneca County, I took photos of my husband and daughter skydiving. (No, I didn’t join in — but they LOVED it!) In Livingston County, I hiked the Grand Canyon of the West (Letchworth State Park) — and it’s now become one of my favorite places to paint. Of course, these are important experiences that have impacted how I’ve developed and designed each destination’s brand. But it goes well beyond that. Because I spend time experiencing the here and now in order to really express the essence of each area, it’s taught me how to travel with my eyes fully open. It’s taught me how to be a tourist in my own backyard. And it’s taught me how to tell the whole story. Ultimately, being a traveler, a destination designer, a storyteller, a painter… it all weaves together in my web of mindfulness — yet another aspect of my being. A destination is made up of many things, that weave together to determine its brand, much like you are made up of many things that make up your identity. The real question is: How will you tell the whole story?